Wallpapers is a new Android application by Google which offers similar functionality as the built-in wallpaper app of the Google Pixel phone. Are you a smartphone user who never switches the default wallpaper the phone ships with, or someone who likes new wallpapers? If you belong to the latter group of users, you may find Google's Wallpaper application useful for that task. While most smartphones ship with capabilities to change wallpapers, and some even with stores to download free wallpapers, others dont or the selection may not be to your liking. The Wallpapers application by Google requires only one permission -- access to photos, media and files -- which seems reasonable for an application of its kind. The app features curated wallpapers sorted into several categories. The categories that it supports currently are Earth, Landscape, Cityscapes, Life, Textures and Live Wallpapers. You may browse the selection with a tap, and set any wallpaper you find interesting as the device's wallpaper with two additional taps (one on the thumbnail, the other on the set wallpaper button). 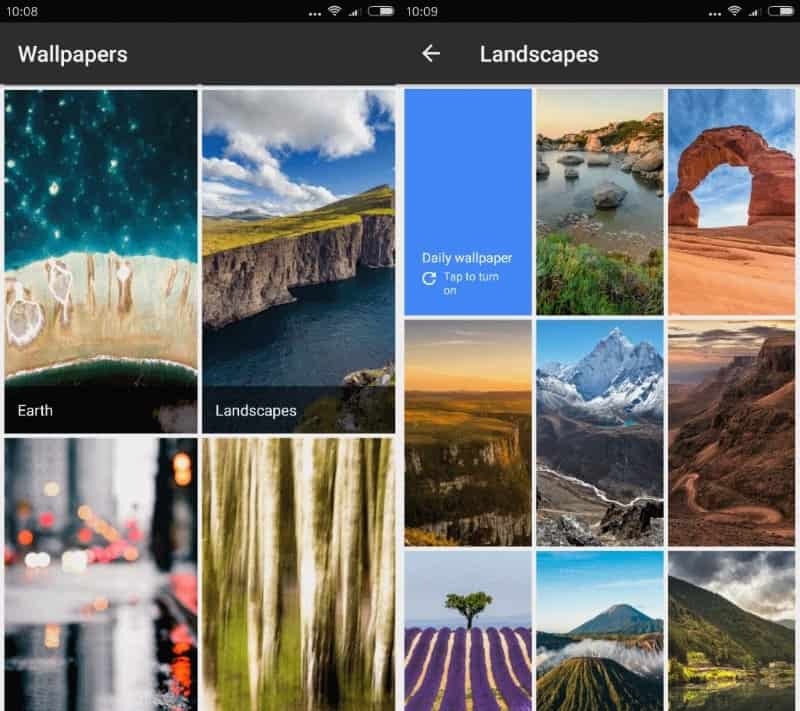 While that is interesting in itself, as you get access to hundreds of good looking wallpapers for your device, Wallpapers features another feature of interest. You may set it to rotate wallpapers of a category automatically. The cycle is set to 24 hours after which a new random wallpaper image is picked, downloaded, and set as the device's background image for the next 24 hour period. So, if you like new wallpapers, you may enable the automatic wallpaper rotation of the Wallpapers application for that. Wallpapers ships without any preferences. This is unfortunate as it means that you cannot change the wallpaper rotation interval, download wallpapers in advance, or create your own little group of wallpaper images that you want the device to rotate between. Android Nougat 7.0 and up users may select to apply the wallpaper to the home and lock screen at the same time, but may also select two different images instead. Those running earlier versions of Android may use it only to change the home screen background image. The app uses quite a bit of RAM on top of that. If your device is short on RAM, you may want to try an app like Muzei instead. Wallpapers offers a good selection of great looking wallpaper images, and it supports changing wallpapers regularly. It is let down by the fact that it ships without any preferences, and is not as customizable than other wallpaper changes or apps for Android. Now You: Do you use custom wallpapers on your devices? So, does it have any real benefit over Muzei? I wonder what Google’s “angle” is on this. IOW, what will they change in the future in order to generate revenue from it? Ads? Data collection?